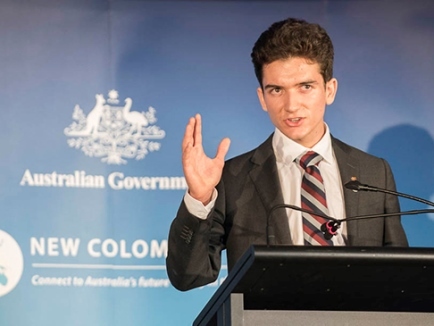 Harrison Steel (fr 11) is the modest old col who was recently awarded one of the most prestigious postgraduate scholarships in Australia – The Roden Cutler NSW John Monash Scholarship. Harry, the name he prefers to go by amongst friends, was a shy but polished Wesley fresher who got involved in many Wesley activities. He was a well-rounded student who played violin, loved languages and sport, and was proficient in all academic areas. He was raised in the country town of Coonabarabran, NSW, which sparked his interest in science and engineering from an early age. He studied a Bachelor of Mechanical (Space) Engineering and Bachelor of (Advanced) Science in Mathematics and Physics, and was involved in the Talented Science Program (TSP). His degree was the perfect balance of applying practical skills to theory. During the summer breaks of his undergraduate degree, he stayed at Wesley and worked as an office assistant while interning at different organisations on other days. Already he has published many research papers across a variety of fields; these include working with NASA on Antarctic environments of astro-biological interest, as well as new methods for lung cancer treatment that he worked on at the Royal Prince Alfred Hospital (RPA). “That’s what I’m more proud of, my involvement in science as an undergraduate”, he says of how he spent his days living and studying on campus. The John Monash Scholarships are amongst the most significant postgraduate scholarships currently available in Australia. Scholars are recognised for excellence and leadership from universities across Australia. Applicants endure a rigorous application and interview process and only the best scholars with outstanding results are selected. The scholarships are awarded annually for up to three years of postgraduate study which can be completed at any leading university outside of Australia. Premier Mike Baird is a strong advocate for the John Monash Foundation postgraduate scholarships. His office has funded and named one of the scholarships in honour of the former NSW Governor Sir Roden Cutler, which was awarded to Harry in November 2015. Harry has decided to use the scholarship to complete his Doctor of Philosophy (DPhil) in Engineering Science at the University of Oxford because they are a world leader in his topic of interest: The development of control systems for Synthetic Biology. Without a doubt it’s an excellent opportunity to be part of such a strong network of influential minds. Harry believes his postgraduate study will open the door to many career opportunities because investors (and the government) understand the developing potential of Biotech; to provide clean energy sources, environmental protection, and new medical technologies. Harry’s aim is to “engineer bacterium that can make industrial processes more efficient and less harmful to the environment”. Specifically, to develop bacteria that can provide clean energy sources or new synthesis pathways for medicines – thereby making them more affordable. There are many unknowns in the field of Synthetic Biology – but one thing we know for sure is that Harry will be part of some of the major developments in the industry.